I blogged about MTN last year after their presentation at Facebook's TIP Summit. This year again, another MTN Group executive, Babak Fouladi, Technology and Information System (Group CTIO) at MTN delivered an insightful talk. I have my summary below with video embedded at the end. MTN has 223 million subscribers. Out of that only 72 million are data users, the rest are primarily voice users. The problem with that is their monthly spend is very low. The typical entry and emerging segment customers in rural areas spend 30% of their incomes on food and often have limited access to reliable basic services. Its very tricky to convert these users to use high amount of data or any data at all in many cases. 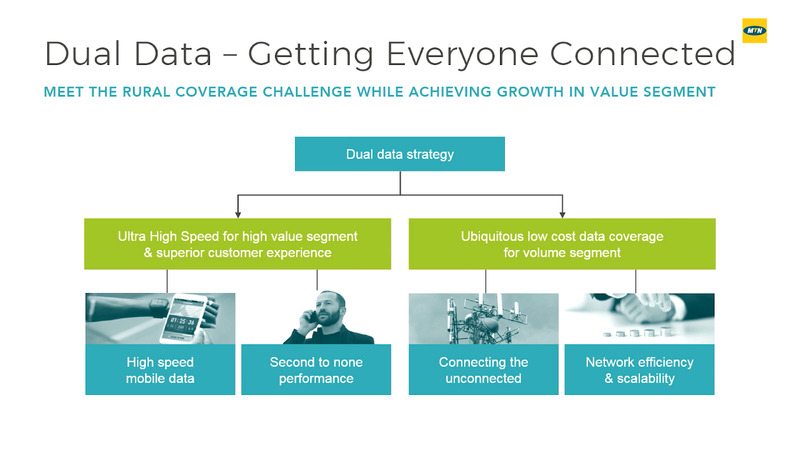 To overcome these challenges, a dual data strategy is needed. Newer technologies, ultra high speed & superior customer experience for high value segment. Ubiquitous low cost data coverage for volume segment. 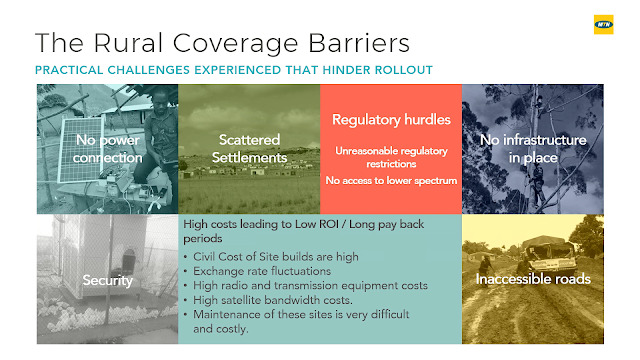 There are many rural coverage barriers. These practical challenges hinder the rollout. The main being that there is no infrastructure in place, the roads are inaccessible, there is no power, the security is poor, etc. MTN are already doing field trials with AMN and Huawei. With Huawei, they are using the RuralStar (see earlier post here). Other vendors listed above are working with them in the labs and will be trialed for Ultra and Ultra-ultra rural sites. Their main motivation for working with Facebook and TIP is to find affordable solutions for Ultra and Ultra-ultra rural locations. There is a large scale trial happening soon in 2 countries, 120 sites in total. One of the challenges in African market is that the average lifespan of handset is 7 years. 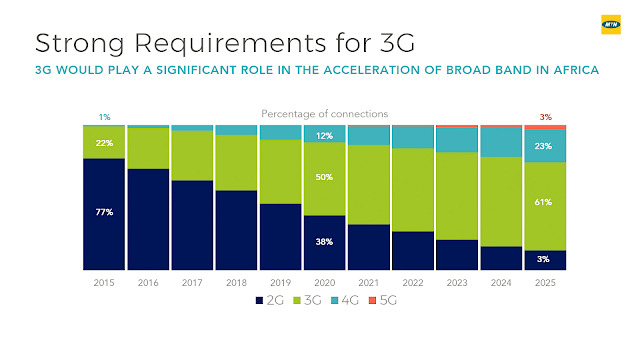 What this means is that many people still on 2G today will be migrating to 3G in near future. As a result, 3G will be the most dominant technology in Africa in 2025. While most operators and vendors are focusing on 4G and 5G, there is still going to be a big market for 2G and 3G in 2025. These users cannot be ignored and the operator that serves them well will eventually be the winner. 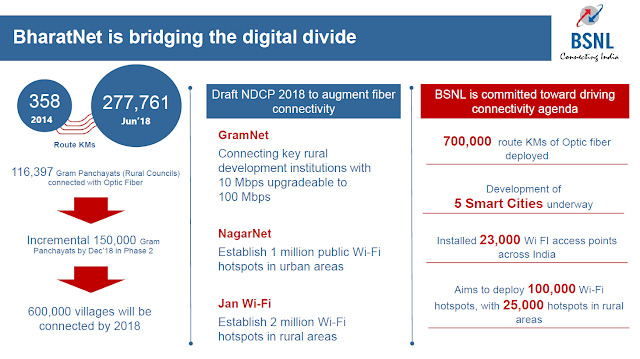 BSNL is committed towards driving the connectivity agenda. 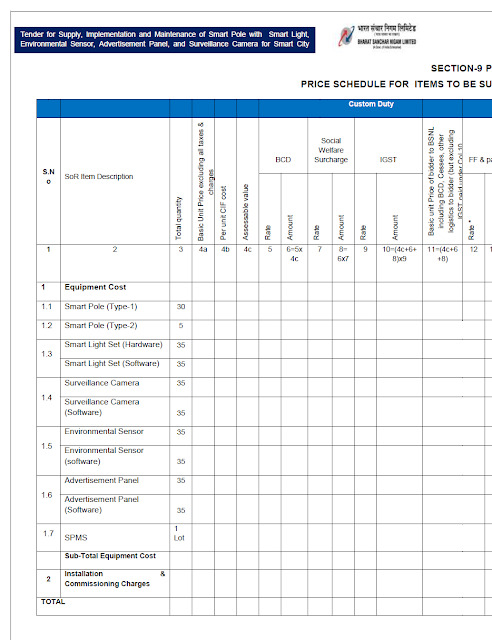 This is why its selected Nokia for smart pole deployment across India. Nokia has been selected by Bharat Sanchar Nigam Limited (BSNL) to support the transformation of India's cities through intelligent infrastructure. Nokia will supply, install, commission and maintain the Smart Telecom Poles across India in all of BSNL's telecom circles. Under the contract, Nokia will also integrate the poles with smart LED lighting systems, CCTV cameras, digital billboards and environmental sensors that provide strong revenue generation potential for the operator. The smart pole has been designed for emerging markets and built in India based on Nokia's global services expertise. Back in June, BSNL issued a tender for supply, implementation and maintenance of smart pole with smart light, environmental sensor, advertisement panel, and surveillance camera for smart city. There is no direct link but can easily be found via search. Here were some of the requirements they were looking for. Finally, I noticed the following picture being used by some websites (example) along with the announcement. I am not sure if this is Nokia pole. 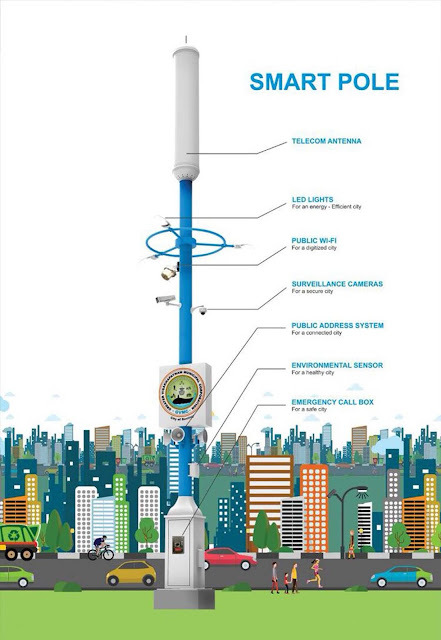 This looks like the 'Multi Utility Pole' from Vizag (Visakhapatnam) smart city project. Will share more info when available. Optus has won the Satellite Provider of the Year award at Communications Alliance’s 2018 ACOMM Awards dinner. Optus received the distinguished award for its Satellite Small Cell in a Container. Optus designed the standalone, autonomously-powered solution to extend the Optus mobile network, using Optus' satellite backhaul service, into remote regional and rural sites where other telecommunications facilities, infrastructure and power are unavailable. Nick Leake, Acting Head of Satellite Networks, said Optus is committed to decreasing the digital divide in geographically challenging locations. 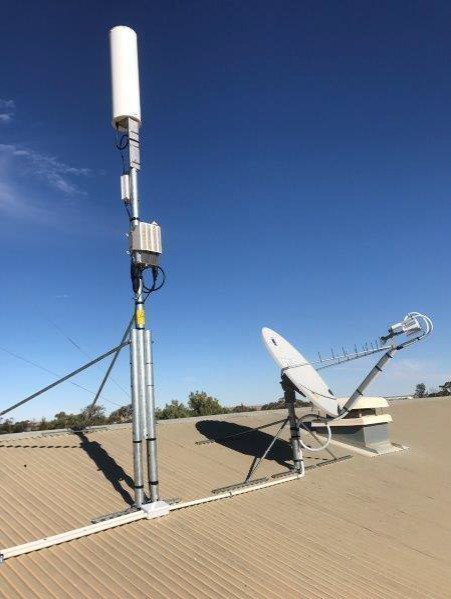 Optus was the first in Australia to deliver satellite small cells, enabling 3G mobile coverage and extending the Optus mobile network into remote, rural and regional locations using Optus’ satellite backhaul service. Mataranka National Park in the Northern Territory was the first site to benefit from the Satellite Small Cell in a Container, with ten additional sites in the Northern Territory, South Australia and Western Australia currently being built, tested and rolled out. I blogged about the Australian mobile notspots program earlier here and Parallel Wireless CWS Radios helping Optus connect Australian outback via satellite here. This Optus deployment won Small Cell Forum award in 'Excellence in Commercial Deployment of Rural/Remote Small Cells' category in 2017 along with Parallel Wireless for their CWS & Gilat for satellite backhaul. 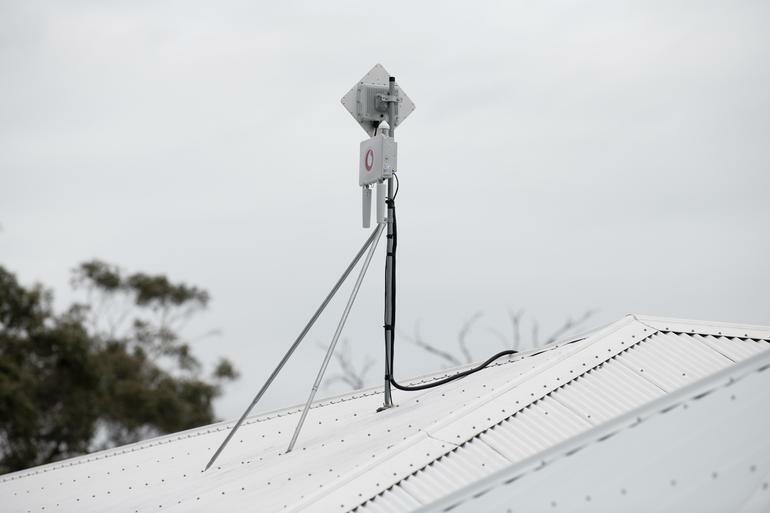 Vodafone Australia has unveiled its new technology for helping improve mobile signal for voice, data, and Internet of Things (IoT) in regional areas, with its Vodafone Regional Coverage Hub. The Hub is a simple, self-install, small cells solution. It relies on ethernet backhaul for connectivity with the operator network. ZDNet reports that this has been developed in partnership with Nokia. 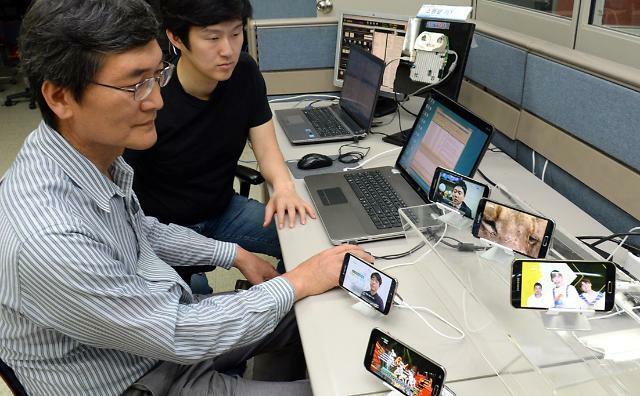 Nokia has a similar solution called Kuha that they have trialed in UK. Vodafone press release mentions that this hub was able to provide coverage for 8 sq. km., which is roughly 1.5 km radius. Its a low power solution so coverage area would be restricted. 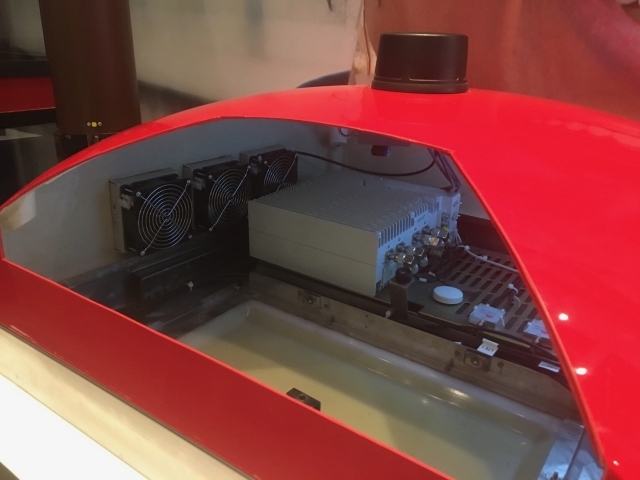 The small cell is providing 4G and NB-IoT coverage. Its interesting to note that as this is 4G only, older 4G devices and devices that do not support VoLTE will not work on this small cell. 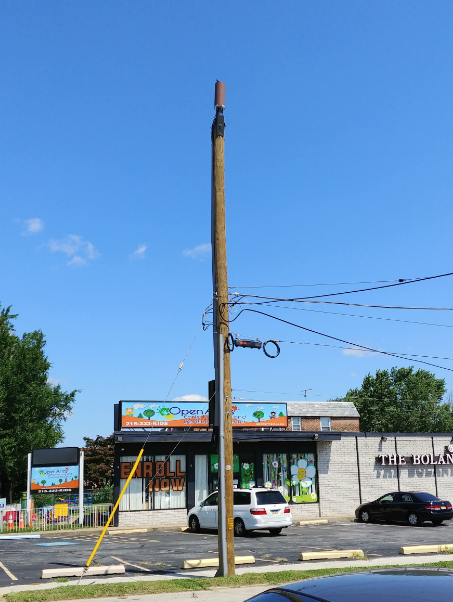 We blogged about Sprint's outdoor small cells in pictures last month, not we just heard about AT&T's small cells on wooden poles. Will be glad to tweet comparable photos from other carriers to show it is NOT impossible! 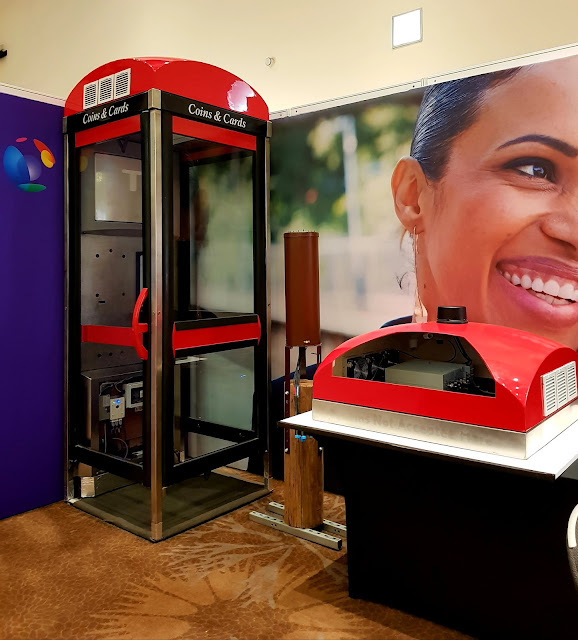 The 3G4G Blog: AT&T Blog: "Providing Connectivity from Inside a Cactus"
The UK National Health Service (NHS) turned 70 on 5 July 2018. To celebrate this they have also created a dedicated website here. Back in June, Dean Bubley tweeted about NHS's WiFi Journey from Small Cells World Summit 2018. 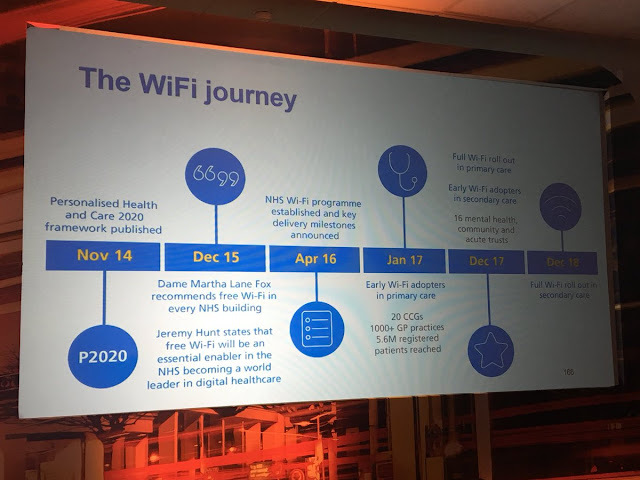 By December 2018, Full Wi-Fi rollout in secondary care will be completed. 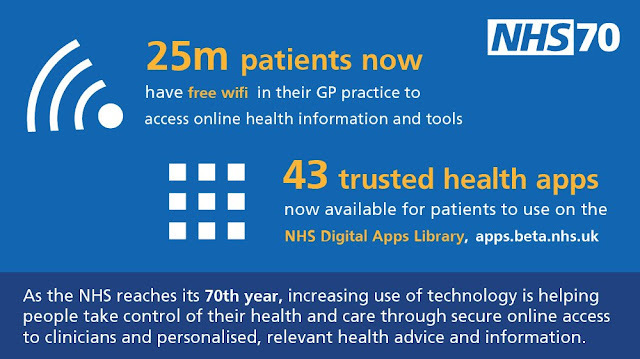 NHS Digital is working to make sure that everyone can access free WiFi in NHS sites in England. NHS WiFi will provide a secure, stable, and reliable WiFi capability, consistent across all NHS settings. It will allow patients and the public to download health apps, browse the internet and access health and care information. Local Clinical Commissioning Groups (CCGs) and NHS trusts are responsible for choosing a supplier that can provide an NHS WiFi compliant system which suits their needs, and working with them to implement it across their local NHS sites. The chosen system must be based on a set of policies and guidance defined by NHS Digital. Make sure to follow David to keep up to date on this subject. SmarTone, the smallest mobile operator in Hong Kong, said it installed small cells using licensed assisted access (LAA) technology in a number of congested areas in the territory and plans to extend the rollout to additional locations. The operator, with a 17 per cent market share by subscribers, said its LTE network now makes use of both licensed and unlicensed spectrum as well as five-carrier aggregation to reach theoretical peak download speeds of 1Gb/s. The LAA small cells were deployed in Central, Causeway Bay, Tsim Sha Tsui, Mong Kok and Shatin districts. 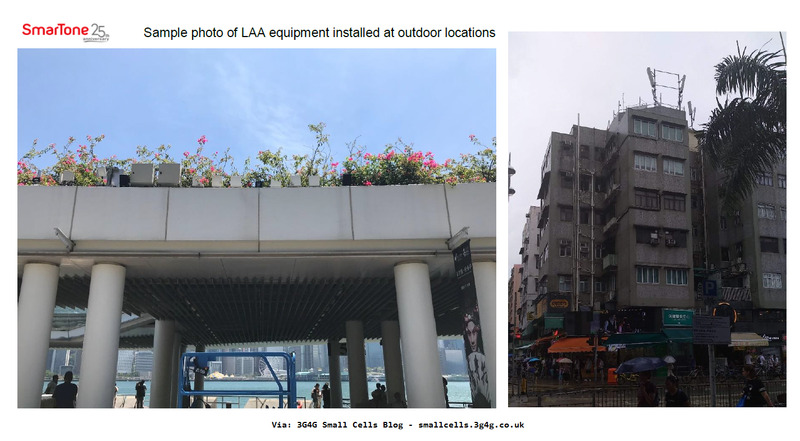 By installing LAA small cells in strategic locations, the operator said its network can absorb traffic surges during festive and special events. In June Hong Kong’s regulator allocated additional spectrum for the provision of public mobile services, a move it said would put the market at the forefront of adoption of advanced technologies including LAA. The Communications Authority officially allocated 580MHz of spectrum in the 5GHz band. I have written about LAA on the 3G4G blog here. I have also expressed doubts here with increasing densification where Wi-Fi and Mobile signals will have to compete to deliver best end-user experience. 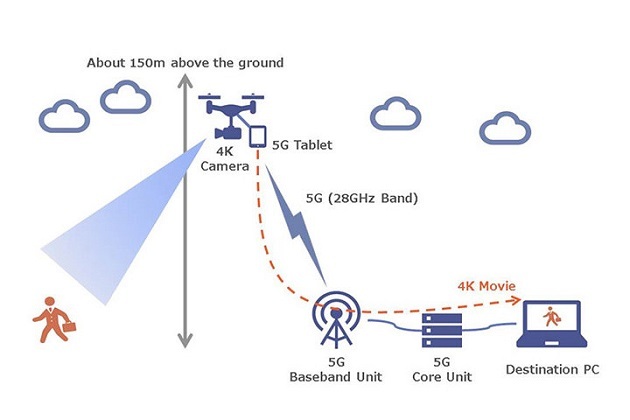 The Ericsson LAA technology deployed by SmarTone combines licensed and unlicensed LTE carriers with 5CC carrier aggregation, 4×4 MIMO and 256 QAM to enable gigabit level speeds (at least theoretically – real-world speeds are likely to be around half of that, although that’s still way faster than current LTE speeds). 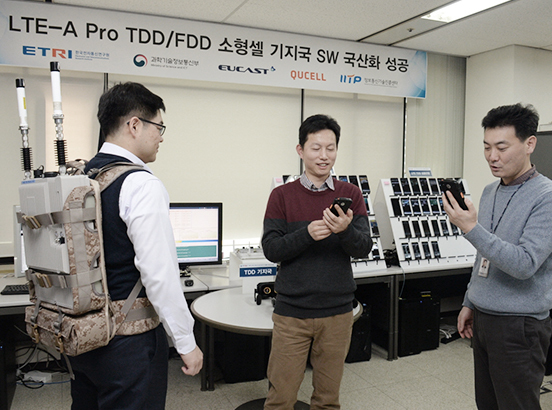 One catch with LAA is that it requires customers to use an LAA-compatible smartphone to take advantage of the faster throughput speeds – and there aren’t very many of those at the moment. According to the latest report from the GSA (July 2018), commercially available handsets supporting LAA include the Samsung Galaxy S8, Note 8 and S9, Sony’s Xperia XZ Premium and Xperia XZ1, HTC’s U11, LG’s V30 and V30+, and ZTE’s Nubia Z17. One reason there aren’t many handsets is that the LAA ecosystem is still in its infancy, and few operators have commercially launched LAA – in fact, SmarTone is only the fifth cellco in the world to do so. Meanwhile, the GSA counts just 22 LAA trials and deployments in progress. Test report on Licensed Assisted Access (LAA) using the unlicensed 5 GHz band by SmarTone Mobile Communications Limited is available on Hong Kong's Office of the Communications Authority website. See September 2018 report here and January 2018 report here. HTCL (Hutchison Telephone Company Limited) also known as Three Hong Kong is also looking at LAA and is doing its own testing. Test report from The Communications Authority website is available here. 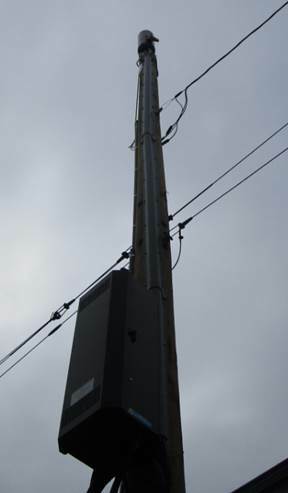 Sprint has been deploying outdoor small cell with more than 15,000 already deployed. 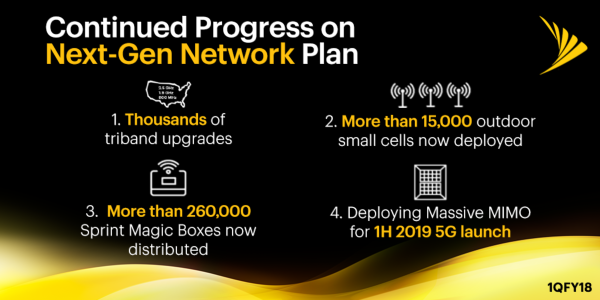 This is not as aggressive as T-Mobile that plans to deploy 25,000 just this year but Sprint is also deploying MagicBox, its indoor small cells. According to Sprint newsroom, more than 260,000 magic boxes have been distributed to date. In fact they are so popular that the hospitality edition was released last month. It should be pointed out that in USA, the definition of Small Cells is often fuzzy. While we refer to small cells as complete base stations, out there small cells can also mean small form factor RRH/RRU. Some of these small cells will have BBU hidden away. 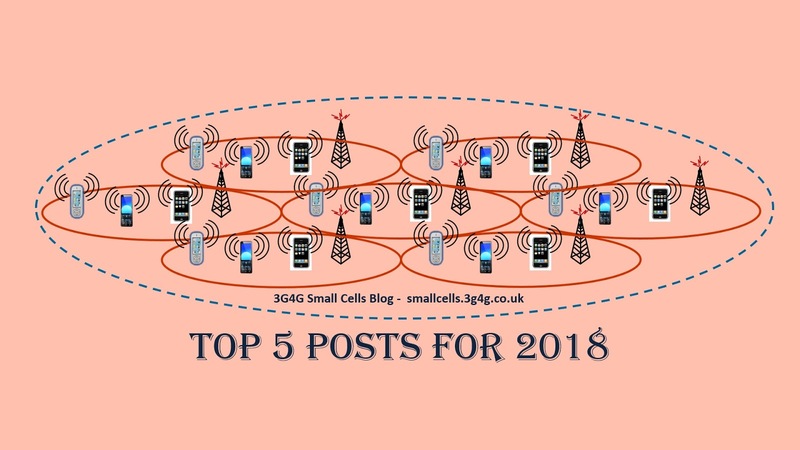 For more details see our tutorial on small cells and macrocells here. I realised that even though I wrote a post on SCF winners, I never published it. Better late than never. Small Cell Forum Awards have been around for 10 years and are highly respected for their impartiality and independence. 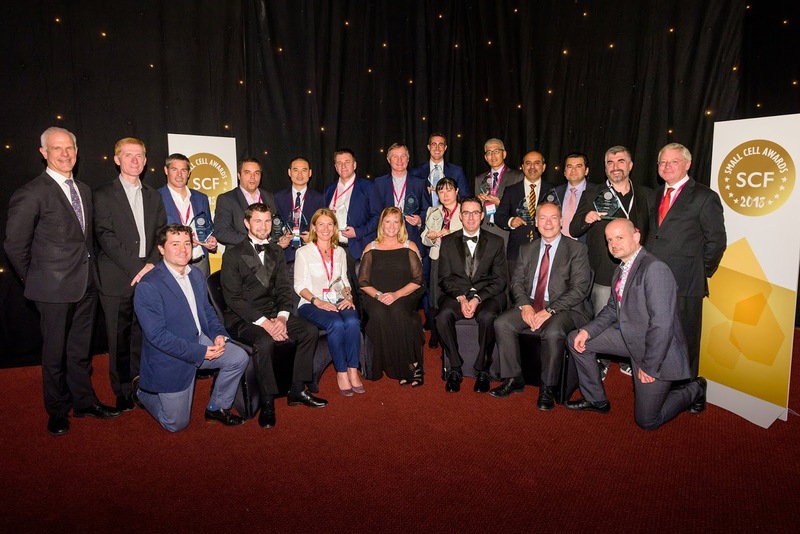 I was at the awards back in May, representing Parallel Wireless (as I am the marketing representative based in Europe). It was fun catching up with colleagues and old contacts and also good to see first hand all the companies competing for these prestigious awards. Below are the names of all the winners. Some of them are linked if I wrote a post about them. T-Mobile keeps talking up its small cells and 5G deployments. ICYMI, I recently wrote about the 5G rollout in 600MHz on 3G4G blog here. 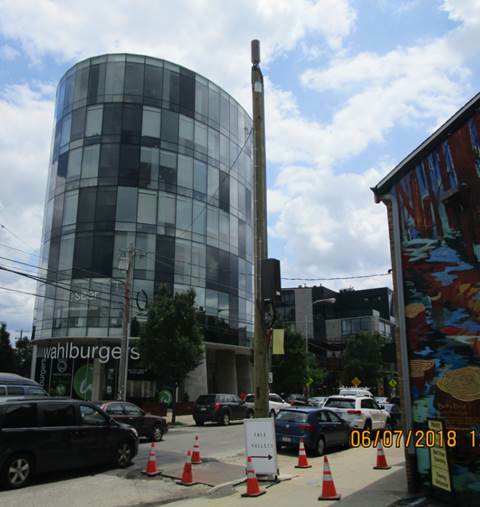 In a recent interview in Fierce Wireless, T-Mobile’s SVP of radio network engineering and development, Mark McDiarmid reminded everyone that the company plans to deploy up to 25,000 small cells this year, some just a few hundred yards away from one another. 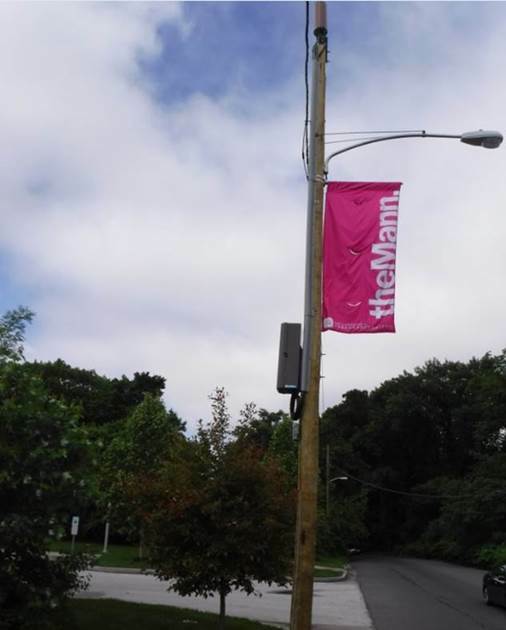 This is all following on from the announcement last year that T-Mobile has contracted to deploy 28,000 small cells. Since then T-Mo has quietly changed its strategy from LTE-U to 3GPP standards based LAA. This was on back of a successful trial with Ericsson where they achieved speeds of 1.1 Gbps using 12-layer Licensed Assisted Access (LAA) technology – the first in the world to hit speeds beyond the 1 Gbps threshold on unlicensed spectrum. We aren't announcing any other cities at this time. However, the small cells being deployed today are LAA ready while we upgrade existing small cells. These all use our existing bands. At a cell site at 45th St. and Third Avenue in Manhattan, T-Mobile is combining 20MHz of its Band 4 spectrum with 60MHz of LAA spectrum. 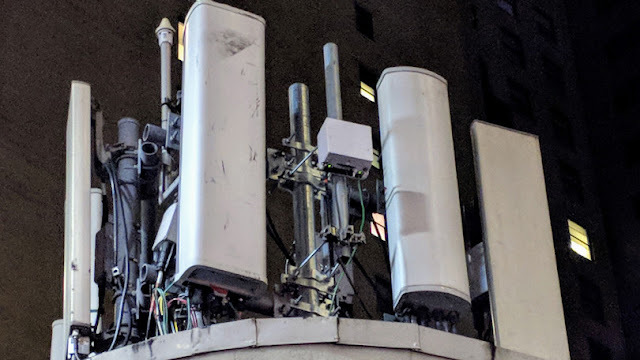 Phones connect to the cell site and send data up using the 1700MHz/2100Mhz Band 4 spectrum, and then get downloaded data via a combination of Band 4 and LAA. Those speeds are insane. In 13 tests, we got an average of 503Mbps down and 42.7Mbps up. Just to compare, in Ookla's Speedtest Intelligence database, the top 10 percent of T-Mobile download speeds in that ZIP code are only around 70Mbps down. 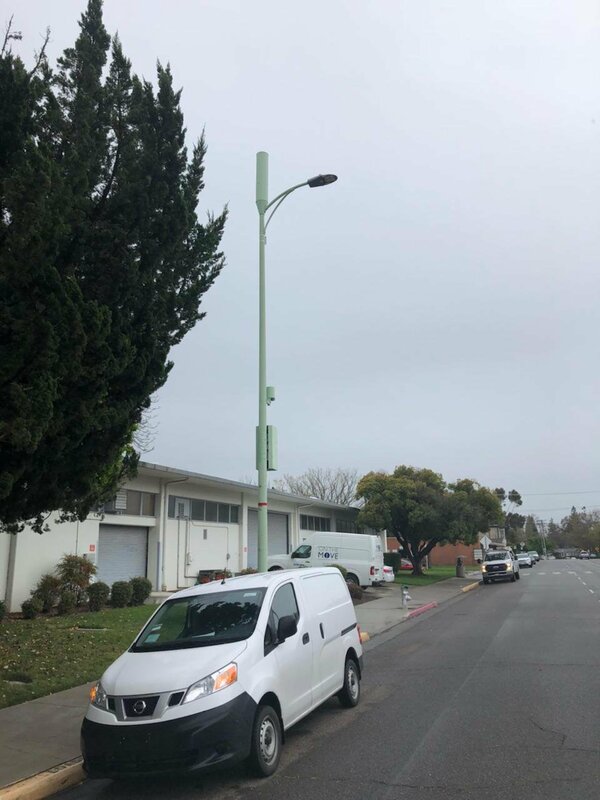 LAA-capable phones can get up to ten 100Mbps download streams on this cell site, with four on the licensed spectrum (4x4 MIMO) and two on each of three channels of LAA spectrum, Milanovic said. Other users on this cell site will do well, but not as well as LAA users, Milanovic notes. The site is also equipped with T-Mobile's workhorse Band 2 and the low-frequency Band 12, which penetrates inside buildings. LAA is only a solution for dense urban areas, though. This cell site has a coverage diameter of about four blocks (a bit over 1,000 feet), which is considered pretty good for LAA. That's a little better than what the coverage probably would be if the site was sending down 5GHz Wi-Fi, and it's a little better than New York's LinkNYC public Wi-Fi posts. 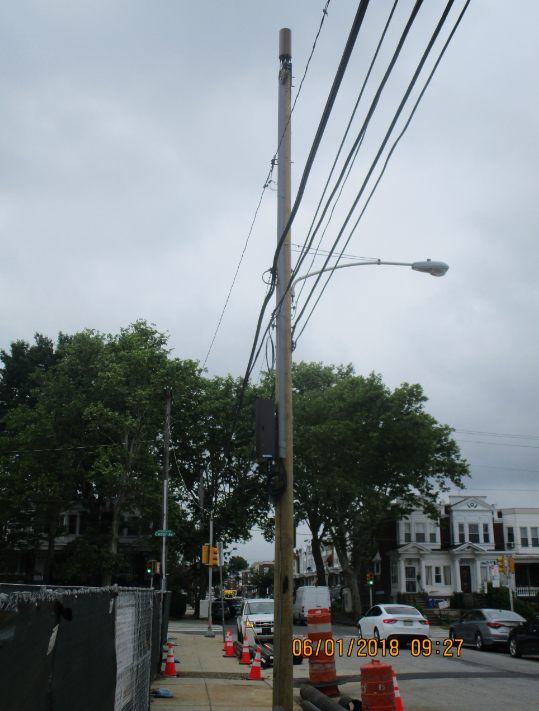 A nearby LinkNYC post doesn't appear to be interfering with the T-Mobile signal, Milanovic said. That's good news, because one of the concerns about LAA is whether or not it will coexist well with powerful public Wi-Fi. You'll need the right phone to hit these speeds, and that's not an iPhone. Currently, LAA is supported by T-Mobile's Samsung Galaxy S8, Note 8, Galaxy S8 Active, Galaxy S9/S9+, LG V30, and the unlocked Huawei Mate 10 Pro £399.00 at Amazon. We'll make sure to test LAA when we go on the road with our Fastest Mobile Networks drive tests this spring. Not everyone agrees that LAA has a long term potential or performs well where 5GHz Wi-Fi channels are very busy. Others (mainly vendors) disagree. You may also enjoy reading Juny Song's article on LinkedIn! Note: I should point out here that what T-Mobile refers to as Small cells are actually RRU's and not complete base stations. You may want to refer to my tutorial here to understand this better. The bottom picture on this post will help too. Its been nearly couple of years since I was involved with EE/BT for their Airmasts project. Details here with some good links in that post too. Since then many other operators have been involved with something or other to do with drones, blimps, balloons, etc. KT has unveiled its 5G emergency network service called Skyship that uses airship drones to search for survivors in the aftermath of disasters. 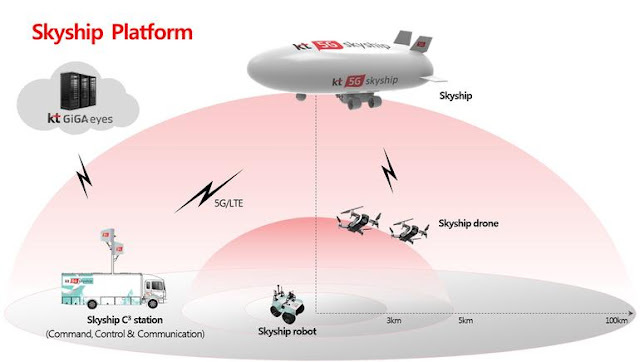 KT collaborated with local drone maker Metismake to design the helium gas-based airship, which has an attached pod with propellant, network module, high-resolution camera, and a trunk that can deploy smaller drones to the ground. It was designed in NACA airfoil and can maintain stable flight in 13 metre-per-second winds. It has a maximum speed of 80 kilometers per hour and can fly up to six hours. More details on ZDNet here. More details on Netmanias here. 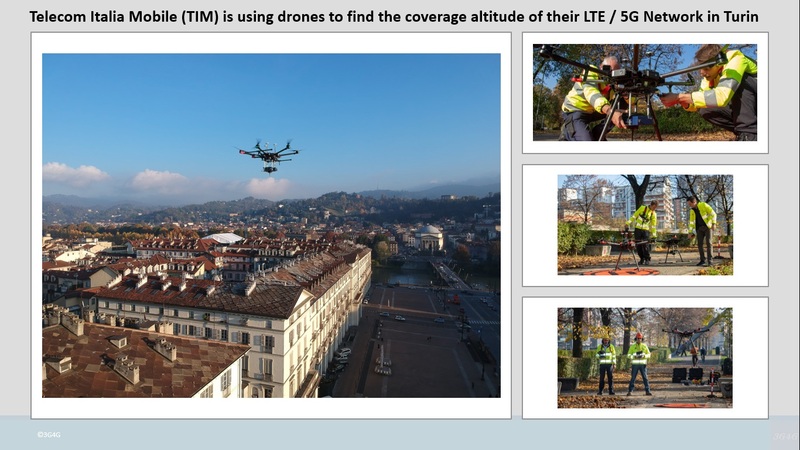 Looking at Drone communications over LTE / 5G, Sequans communications have recently published a white paper looking at how LTE would be a communication technology of choice for drone communications over long distances. There are some issues to resolve including how to get reliable signal in the drones as they fly above the typical coverage zone of an LTE antenna. Ericsson had done some similar study and published a whitepaper on this topic last year. Details available here but the video below is worth a watch too. Huawei’s RuralStar base station can reduce the time to recover the investment to less than five years, compared with more than ten years for traditional rural sites Zhang said. The new site cuts power consumption by 85 per cent and lowers total costs by 70 per cent, the company said. The vendor is having discussions with a number of operators in Africa and Asia about deploying RuralStar sites. Zhang is optimistic there will be strong demand, but noted the new site won’t represent a large percentage of total base station production. The Huawei executive said urban areas also face many challenges in deploying base stations including high rental fees, difficulty in finding appropriate sites and slow deployments, which can take at least one month. To overcome these, Huawei developed PoleStar, which can be installed on lamp posts and a variety of other locations in a matter of hours. Zhang said operators can take advantage of more than 1 billion lamp posts, 10 million bus stops and 10 million phone booths around the world to deploy new base stations more cost effectively. A PoleStar deployment in Thailand using existing traffic and light posts significantly reduced the site footprint, which led to a 66 per cent cut in rental costs. Huawei released RuralStar2.0, an innovative site solution in terms of transmission, infrastructure, base station design, and energy. This solution addresses increasing demands for voice and data services from the unconnected and increases operator ROI for rural network deployment. This solution fulfills the following rural MBB requirements: 2G, 3G, or 4G rural MBB networks providing rates of over 10 Mbit/s at cell edges and cell coverage of 5 km; Extended 2G and 3G coverage at a maximum distance of 60 km from the nearest tower-mounted site, providing voice and data (over 1 Mbit/s at cell edges) services and cell coverage of 5 km. In terms of transmission, RuralStar2.0 adopts non line of sight (NLOS) wireless backhaul, which eliminates rental costs of transmission equipment and significantly reduces OPEX compared with satellite or microwave transmission. NLOS wireless backhaul supports multi-hop backhaul, which allows for a maximum distance of over 60 km from the donor base station, extending network coverage. In terms of infrastructure, NLOS wireless backhaul switches high-rise towers used in traditional rural networks to low-rise poles, reducing site infrastructure costs by 70%. As for energy, low-power base stations and transmission equipment do not require diesel generators for power generation and require fewer solar panels and batteries, which slashes CAPEX by 70%. 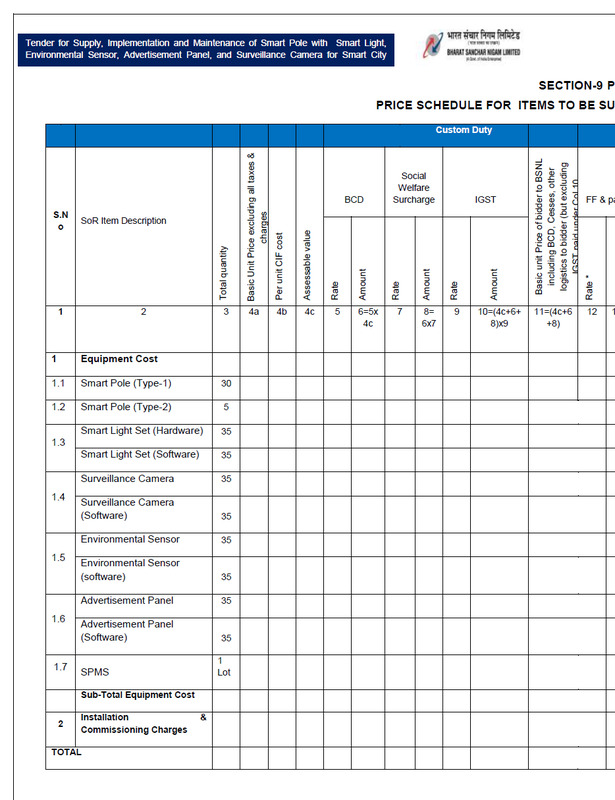 Using pure solar energy saves O&M costs, in turn greatly reducing OPEX. Omnidirectional antennas are used to achieve targeted omnidirectional coverage in a single cell at low cost. For cells with insufficient coverage, innovative 90° high-gain antennas can be used to deploy the butterfly site solution. This solution reduces the number of sectors from three to two, the number of antennas and RRUs by 1/3, and total power consumption by 30% as well as the CAPEX and OPEX compared with traditional sites. For a given population in a target area, RuralStar2.0's innovations in these aspects reduce TCO by more than 50% compared with traditional site solutions. 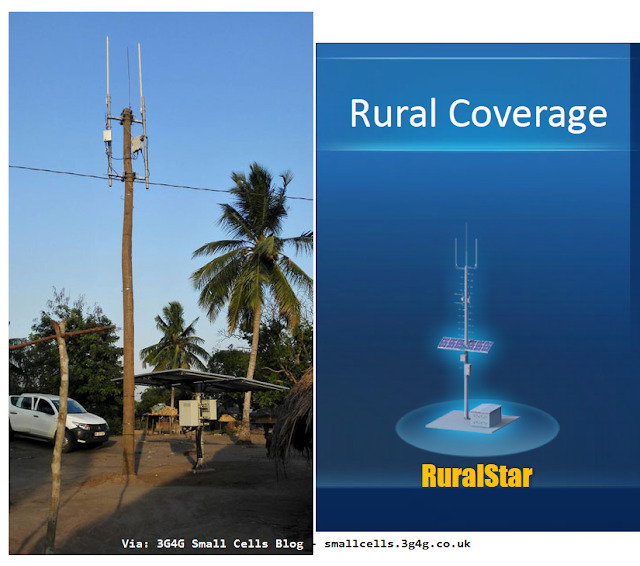 RuralStar has been commercially deployed in many countries, including Ghana, Thailand, Algeria, and Nigeria. Mobile network coverage boosts local economic development and improves local people's lives. At MWC, Huawei’s RuralStar solution has won GSMA’s "Best Mobile Innovation for Emerging Markets" award. In Ghana, local villagers used to climb to rooftops and trees, or even ride a dozen kilometers to find telephone signals. RuralStar has addressed these issues. They can now use WhatsApp to communicate and share pictures at home. Transferring money and recharging call fees through Mobile Money have also become common in daily life. RuralStar enables three transformations, transforming microwave or satellite transmission in traditional solutions to Relay, substituting simple poles for towers, and enabling a move from diesel generators for power supply to solar power. 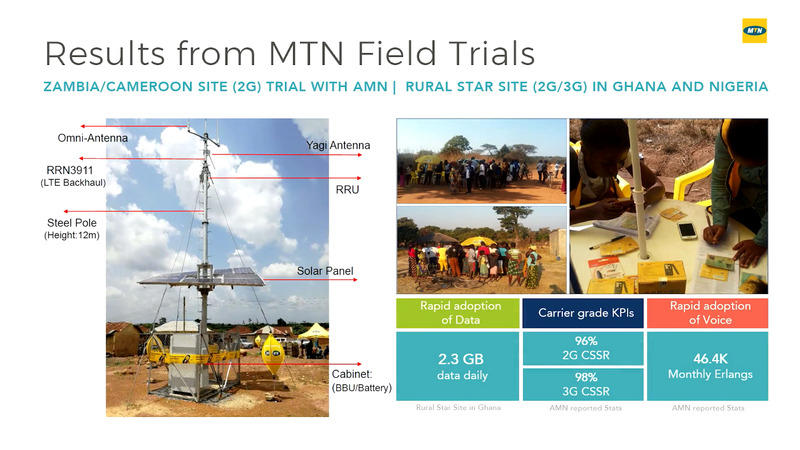 This shortens the return on investment (ROI) period for mobile communications in remote rural areas. Operators can then lower the threshold of profitability by 50%, which is a great help for emerging markets to bridge the digital divide. Over the past week, Afryea's friends were receiving more and more messages from her over WhatsApp - and all thanks to the installation of an amazing “wooden pole”. Afryea is a teacher in a village located in a rural region of Ghana. Having had the privilege of studying in cities, Afryea is used to using WhatsApp, Snapchat and Instagram. However, she explains that it took her an inordinate amount of time to readjust to the life without these Apps after she returned to this village, as it rarely has any signal. Afryea is now delighted to deliver the news to her friends that mobile services are becoming increasingly accessible for a surprisingly long list of devices in her village. Nyakpoo, the village chief, explained to Afryea why people simply couldn't access the network: the nearest base station was more than 20 kilometers from here, so achieving signal reception was no easy task. Before the “wooden pole” base station was installed, the village chief himself often needed to ride his motorcycle a few miles to get closer to a base station in order to use Mobile Money. "Since our village suffered from a lack of electricity and fibre optic cables, there was simply no other way to build a base station. I am amazed that all these issues can be solved with a simple piece of wood." The RuralStar solution changes this. The solution uses a Relay based on 4G technology to realise data transmission, rather than expensive satellite or microwave. Relay transmission does not have the same line of sight (LOS) constraints, allowing a base station to be constructed on a simple wooden telegraph pole instead of a 30m dedicated tower. With low power consumption, RuralStar can be powered just by using six solar panels. Afryea’s village was chosen as one of the first to implement RuralStar. The wooden pole to accommodate the base station is prepared locally in the village. The base station deployment was completed in just one week, with total costs reduced by around 70%, and the pole is now helping to deliver mobile services. Even with such a small population, the operator can expect to recoup the investment in just three years. 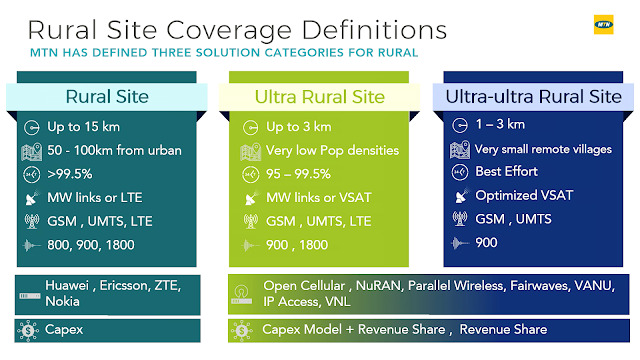 While I commend Huawei for developing a low cost solution for rural deployment, they are competing with several other small cell vendors competing for the same chunk of the market. It is also often of interest to the mobile operators to bring new vendors in rural areas where the requirement to meet KPIs is much lower. This way they can make sure that all the interfaces from their existing vendors are open and standards compliant too. Finally, I have to mention that while the articles talks about power reduction, it is compared to the Huawei's macro products. 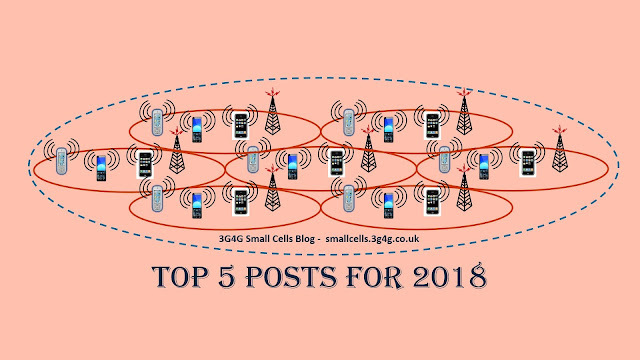 Other small cell vendors may have even lower power and different innovations which may make them attractive for other scenarios. 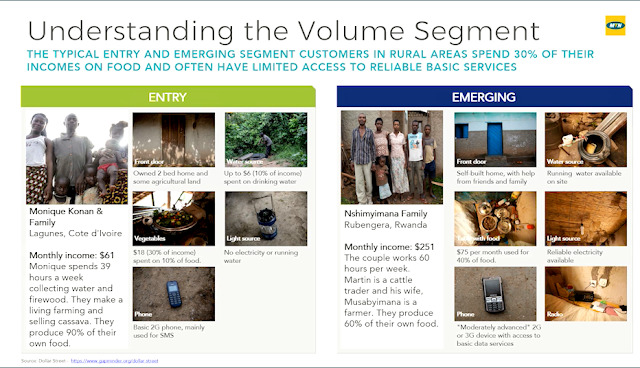 Finally, Nokia has a similar solution for rural deployments. I blogged about the Nokia Kuha here. 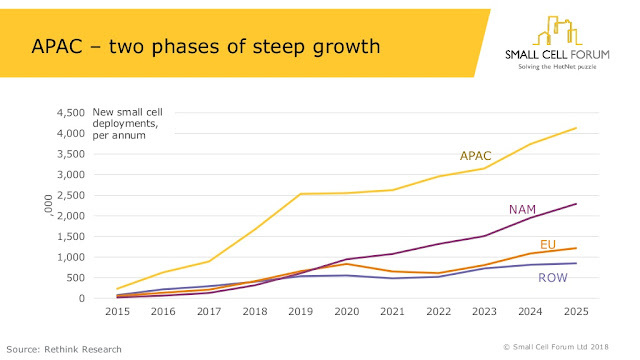 APAC leads the world in network densification, as is clear from recent market data and forecasts out to 2025. New deployments in South East Asia alone are set to be greater than the sum total of those in the rest of the world until 2025. APAC can be characterized as experiencing two phases of growth, with a small plateau from 2019-2021 as 5GNR small cells are being commercialized. 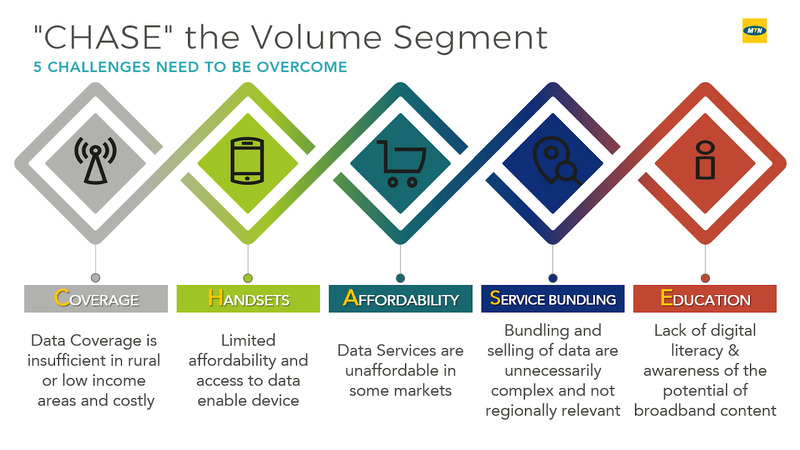 Our survey of MNOs reveals that densification in APAC is primarily capacity driven, to ensure data services maintain their quality of experience as mobile traffic volumes continue to grow. CMRI (China Mobile Research Institute) predicted its data traffic would grow 8x from 2016-2020 and 119x from 2016-2030. Ericsson predicted 8x global growth from 2016-2022, and others cited Cisco VNI’s 7x global growth 2016-2021, dominated by APAC. A summary presentation from the event is embedded at the end. Finally, here is summary of presentation from SCF looking at APAC in detail with regards to drivers and barriers for densification. Latin America has seen rapid growth in the number of mobile internet subscribers over recent years, with a total of nearly 350 million, registering growth of almost 10% since the start of 2016. Of these subscribers, more than two thirds connect to the internet via mobile broadband (3G or 4G) networks. As the importance of digital access and engagement increases, so this figure will continue to grow strongly, to reach about 420 million by 2020. Despite the growth to date, only slightly more than half of the population currently ha0ve a mobile internet subscription, well below the developed market average of two thirds – though some lowerincome groups may connect using Wi-Fi only. As a result, around 300 million people are digitally excluded and unable to enjoy the socioeconomic benefits that mobile internet can bring. By 2020, nearly two thirds of the population will be connected, still well behind the developed market average but in line with the global average. However, nearly 250 million people across the region will still be digitally excluded. There remain significant barriers to adoption, particularly for underserved population groups (rural, women, low income and youth). 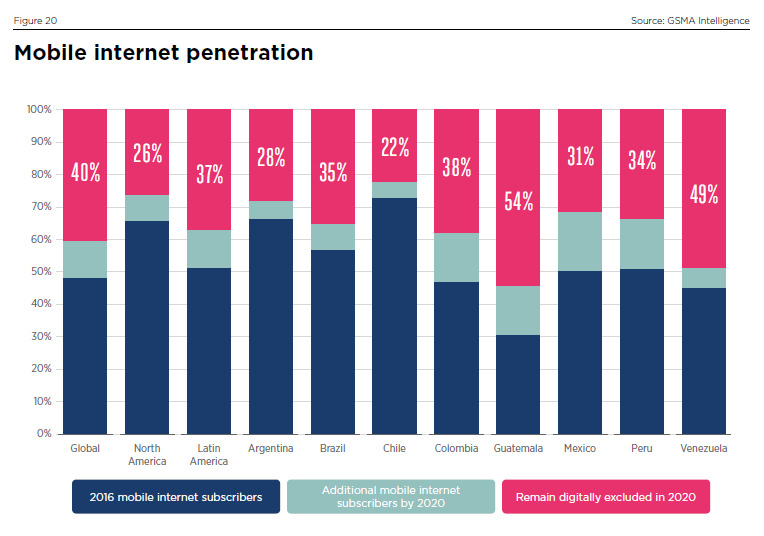 Mobile internet penetration also varies significantly across the region. Chile had the highest penetration as at the end of 2016, with Argentina only slightly behind. In contrast, the Dominican Republic, Guatemala and Haiti have mobile internet penetration rates of one third or less (Cuba has among the lowest levels of mobile internet penetration globally, at 3% of the population). At MWC 2018, Telefónica announced “Internet para todos”, a collaborative project to connect the unconnected in Latin America. The Initiative is aimed at connecting the more than 100 million people in Latin America with no internet access. Telefónica also expanded its collaboration with Facebook on key technological and commercial innovations and collaboration with multiple stakeholders: rural operators, technology firms and regulators. For those who are wondering what “Internet para todos” means, it means “Internet for all. Here is a good video on the initiative. You can read all about it here. One of the vendors mentioned in this press release is Parallel Wireless (*). Their announcement on this is available here. 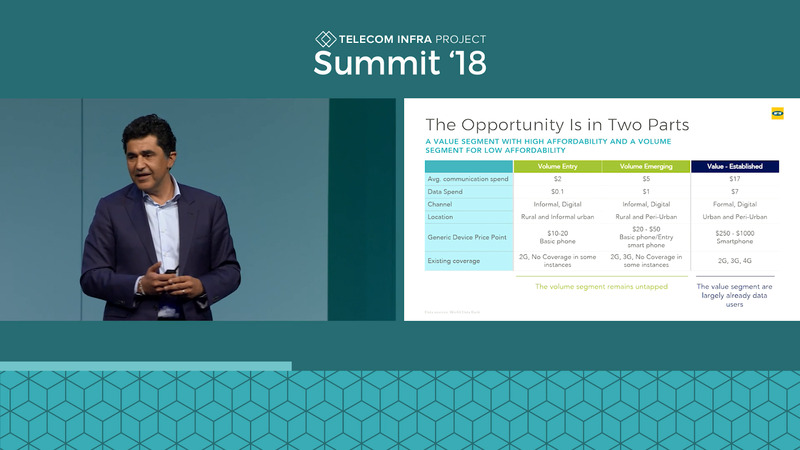 Embedded below is an indepth presentation on this topic by Patrick Lopez, VP, networks innovation at Telefónica. 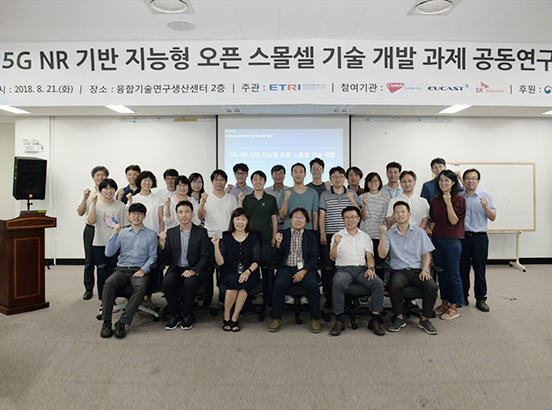 In the recent Small Cell Forum awards, 'Internet Para Todos' won the Social Impact award – Promoting Small Cells for Social/Economic/Environmental Development. And the winner is...? ¡#InternetParaTodos! Hopefully we will see many more similar initiatives from other operators and TIP to connect the unconnected.